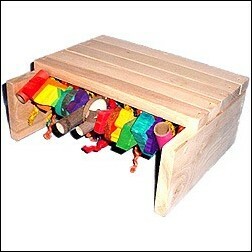 The "Hiding in Style" playcenter measures 6.5" high x 15" wide x 13" long. Timali & Co manufacture their playcenters out of wood to provide a durable piece of furniture for your chinchilla. All staples used are carefully placed and checked so as not to pose any danger to the chinchillas using the center. This playcenter is bottomless to allow you to get to your chinchilla whenever necessary. This promotional auction includes free shipping within the continental United States. Note: International bidders must pay shipping and handling. Visit the Chinchillas.com E-store to see the complete new line of Timali & Co toys!